When I told people I was going to Morocco, EVERYONE suggested Marrakech, and they were all right. 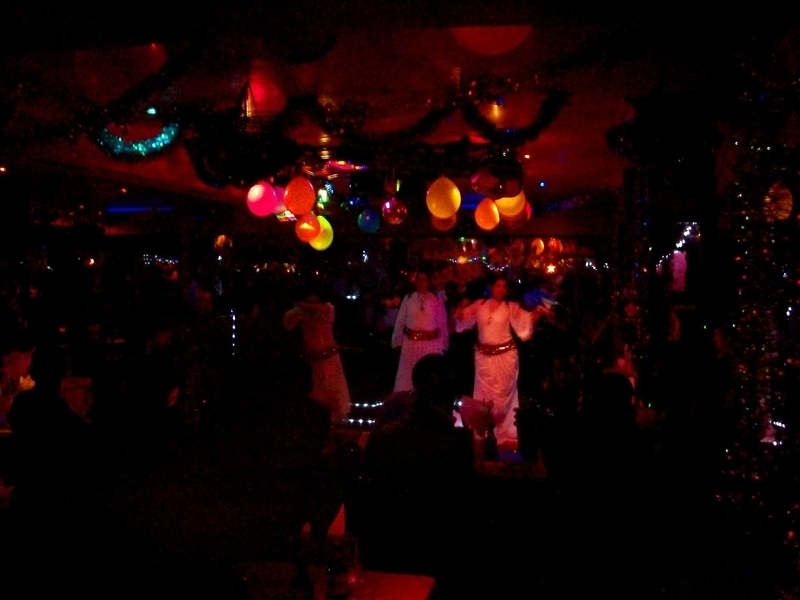 (Everyone also said not to spend too much time in Tangier, and they were right about that as well. Haha!) Marrakech is beautiful! It looks like an oasis amongst the dusty landscape with gardens and palm and orange trees everywhere. Just off of the (overnight) train and it's already prettier than Tangier! Marrakech was the only city where we hadn’t pre-booked a place to stay, so after taking care of that we explored the medina and the souks. The souks were pretty cool! 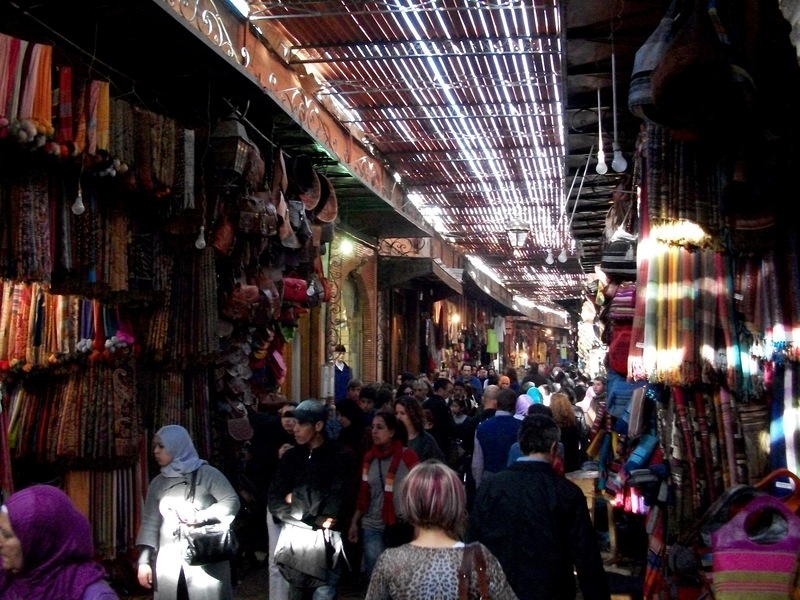 They have everything from knock-off bags, shoes and clothing to Moroccan fabric to spices and pastries for sale. The streets of the souks are all covered by a thatched roof and are somewhat organized in little “neighborhoods” off of the main street according to what’s being sold. 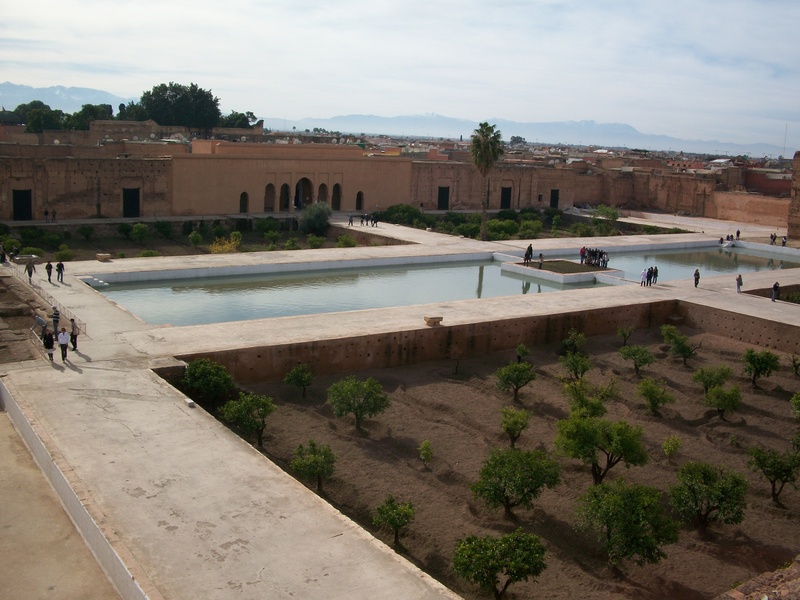 The medina in Marrakech is much bigger and cleaner than the old medina in Tangier. 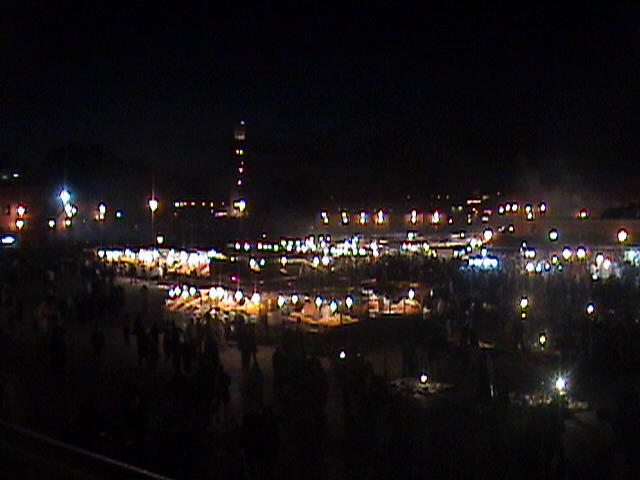 The main plaza of the medina at night full of food, people and performers. We honestly could have spent one more day in Marrakech to see some of its big, famous gardens and a few other sites, but we did get to see some interesting things while we were there! First we went to the Badi Palace ruins, which used to serve as the king’s summer residence and was used for royal events. 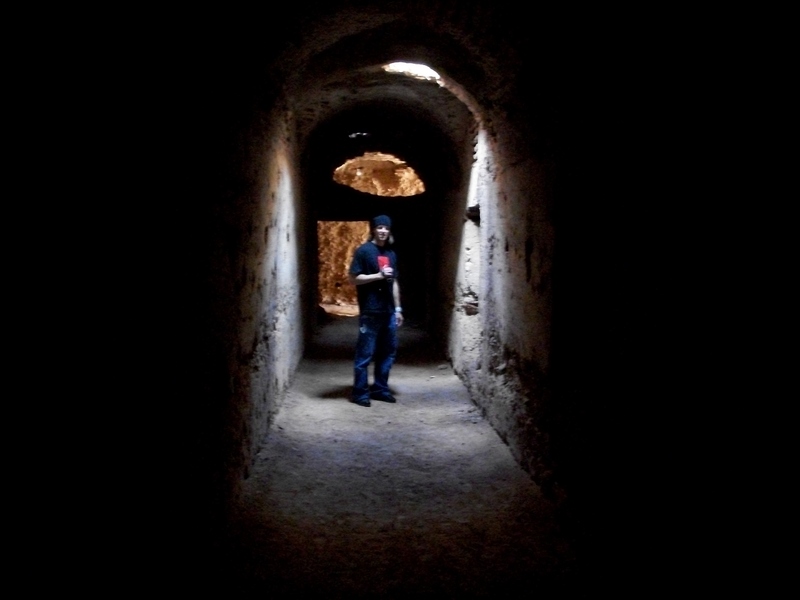 Our favorite part of the palace was probably getting to walk through what we think were old dungeons. Looking down into the open-air pavilion of Badi from the top of the wall. Wandering around in underground hallways. Next we went to a mosque. Yes, we got to go inside a mosque…one of the only ones non-Muslims are allowed into. It definitely wasn’t what I had expected, not that I had any previous idea about them anyway. It had a large, open courtyard with a pool in the middle and rooms surrounding it. Above that there were tons of rooms that people used to live in, almost like a monastery (this was the part I wasn’t expecting). It did NOT have a dome. 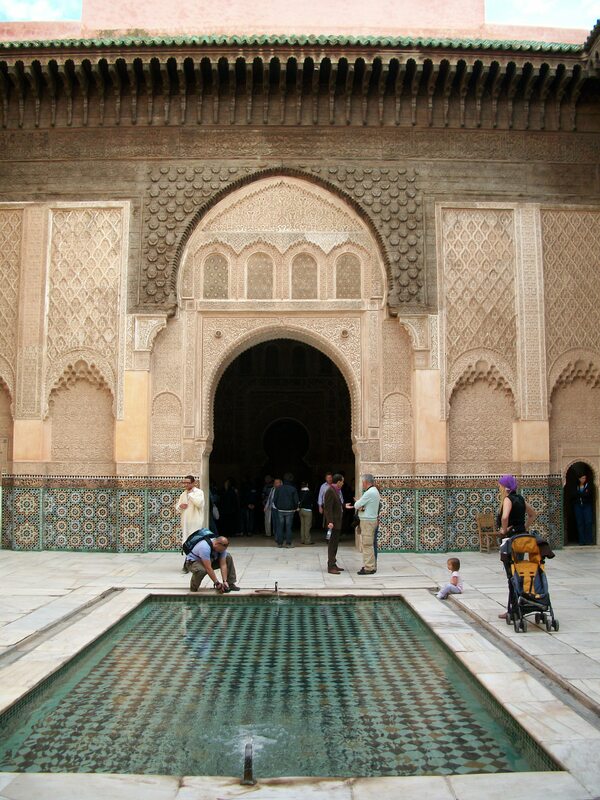 In fact, none of the mosques we saw in Morocco did. I really could’ve sworn that domes were typical of mosques and Moorish architecture but clearly I was wrong. Checking out the different rooms. We also checked out a palace that had been restored and turned into a museum and another site that had been fairly recently excavated. Even though we both loved Marrakech, we were excited to get back to Europe. Mostly to eat some familiar food! 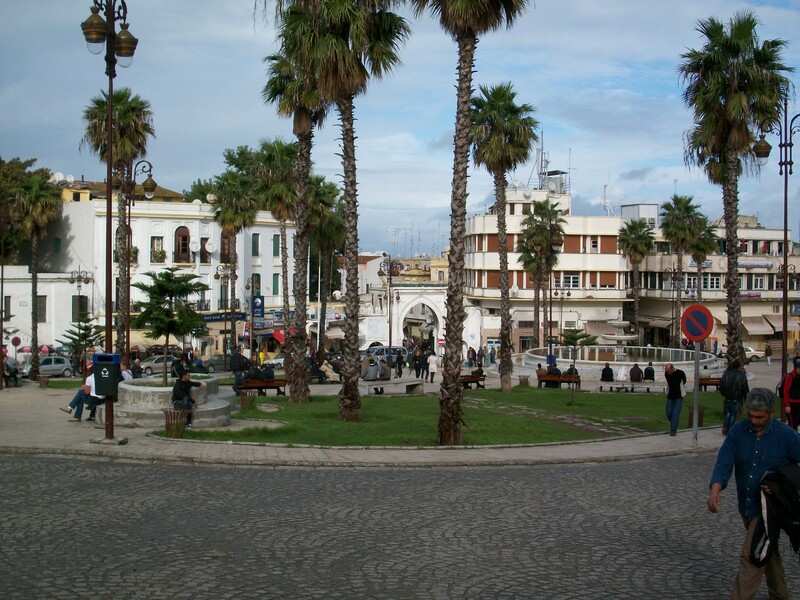 I think the very best way to describe Tangier is culture shock. Of course, I read a little about it before going and expected it to be different, but reading and being somewhere is never the same! Tangier is very metropolitan, crowed and obviously hasn’t been preserved the way other cities I’ve visited in Spain (aka kind of dirty). However, it definitely has improved and still is. Not to say we didn’t have fun and enjoy being in a new place! It was just different. 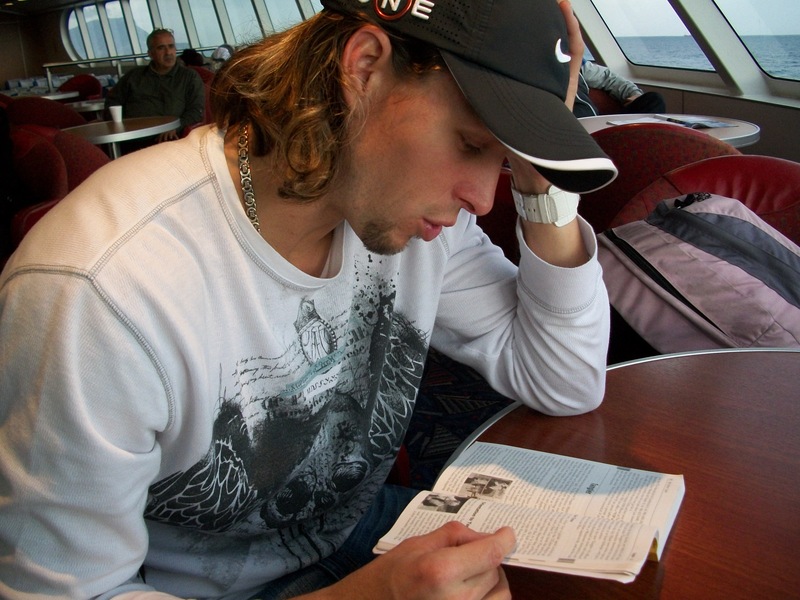 Brushing up on Tangier during the ferry ride. You can't go wrong with Rick Steves! Anyway, we arrived to Morocco at a port a little outside of Tangier. Driving through the countryside into the city was breathtaking! The coast and mountains are right beside each other and the weather was perfect. 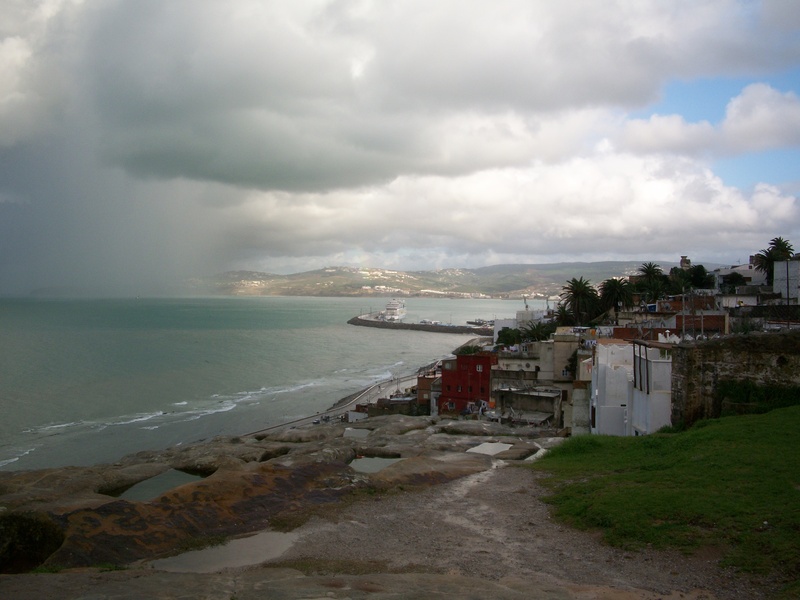 Entering the city of Tangier was an abrupt and drastic change. First, you drive by the newly built and still-being-constructed condos by the beach and then into the city. There are suddenly buildings everywhere! Some are more modern and typical office-looking buildings and others are old French colonial style. The sidewalks were either wide and packed with people or non-existent and still packed. The first night we were pretty exhausted from traveling all day and it started to rain so we walked around near our hotel, ate dinner and crashed. 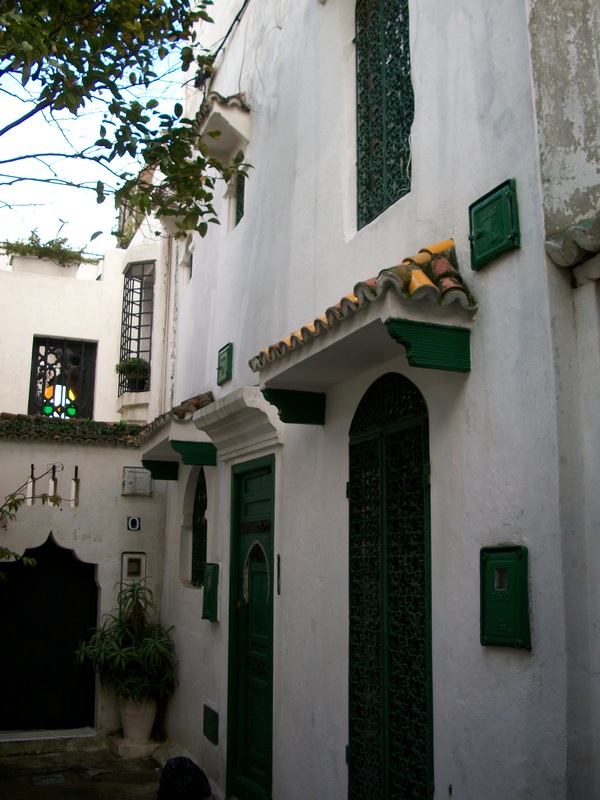 The next day we visited the medina, Grand Socco and Kasbah (the oldest part of the city). This was my favorite day! There are great views from the Kasbah, which used to be an old palace located on the top of a hill in the medina. The palace has been turned into a museum and it, as well as the area around it, is painted white with splashes of color and keyhole doors and arches. 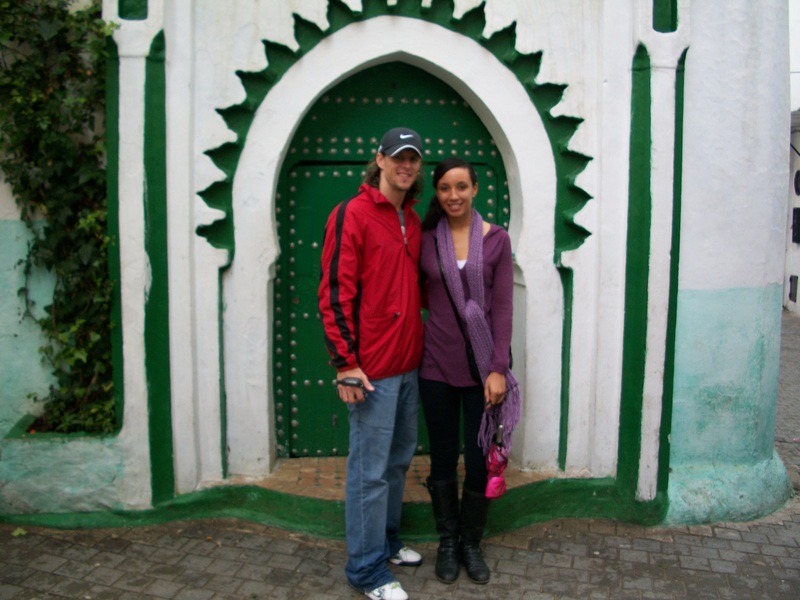 Beau and I in front of one of the many mosques in Tangier/ the medina. View from the old city's perch. So pretty! 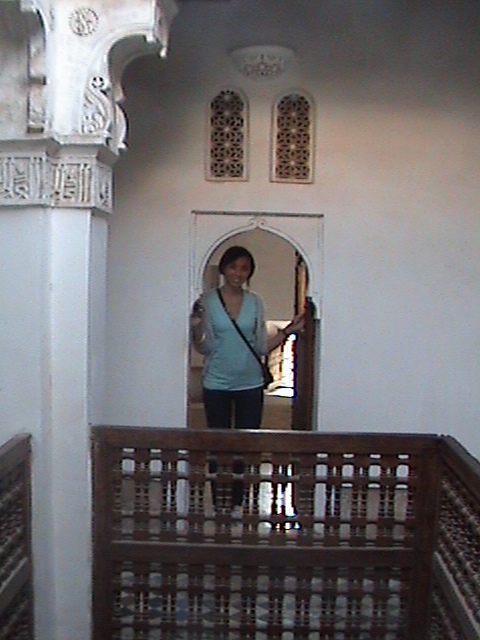 However, getting up to the Kasbah from the old medina was almost an ordeal. From Grand Socco we walked through a keyhole arch to an area with an overgrown plaza and a lot of French colonial buildings. We THOUGHT this was the old medina. It wasn’t. We passed through another arch onto tiny, labyrinthine streets (most of which weren’t labeled) with a few odd smells. Shortly after a group of teenage boys began herding us toward the Kasbah, at which point I was sure they would get us lost then try to mug us. Well, needless to say that definitely didn’t happen. After I made it very clear that they needed to back off (aka freaked out a little), two of the boys, who ended up being good kids and charged us for the unofficial, unsolicited but definitely needed tour, became our guides for the day. 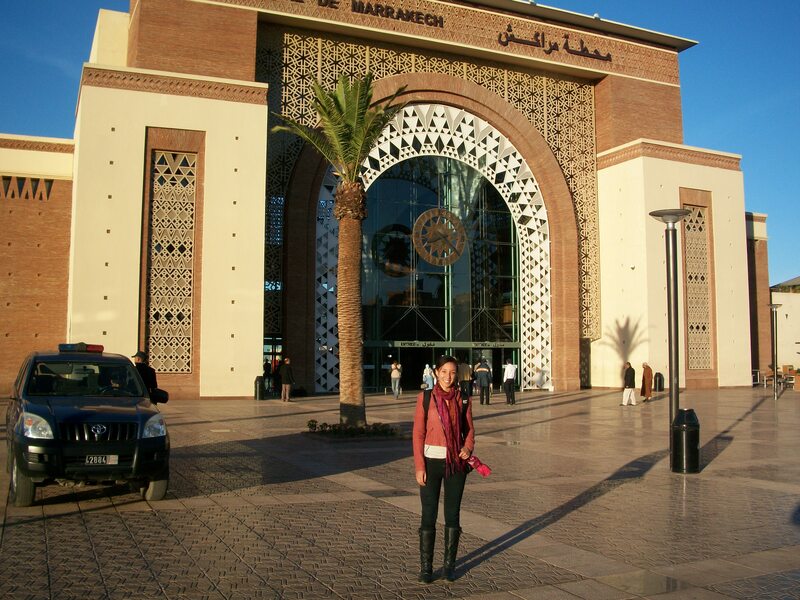 The next day we had to wait around for our train to Marrakesh. 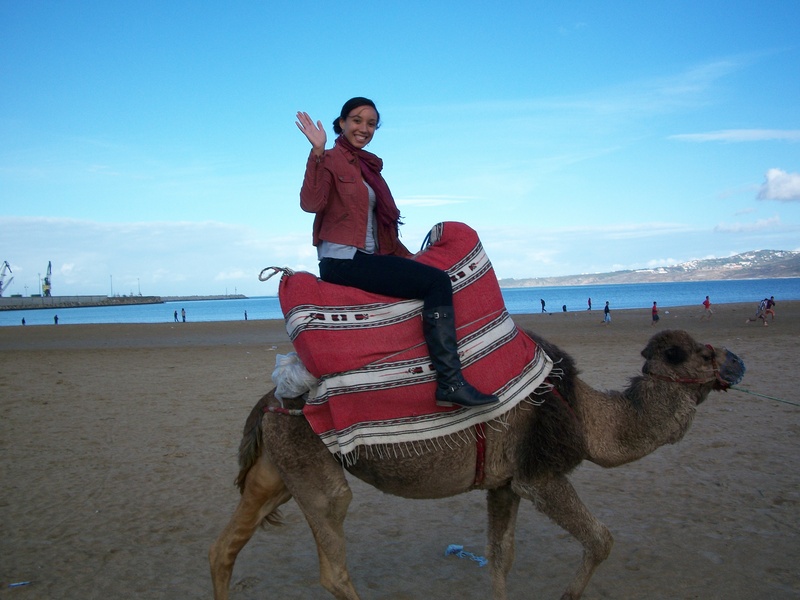 The extra day in Tangier wasn’t really needed, but I did get to ride a camel!